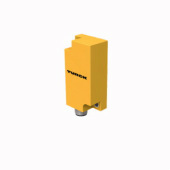 The rugged TURCK inclinometers of the Q20L60 and Q42 series capture almost any inclination and can also be used in systems exposed to shocks or with fast-motion sequences. We offer sensors for angular ranges of ±10°, ±45°, ±60° and ±85° as well as with freely selectable measuring range 0…360°. The following output variants are available for selection: 4 … 20 mA, 0.1 … 4.9 V, 0 … 10 V, PNP/NPN window as NC or NO contact, IO-link, CANopen.